Product prices and availability are accurate as of 2019-02-22 09:46:09 UTC and are subject to change. Any price and availability information displayed on http://www.amazon.com/ at the time of purchase will apply to the purchase of this product. With its large cooking surface, this All-Clad COPPER CORE 650618 SS 6-Quart round roaster is ideal for browning and searing meats and vegetables, while its high, straight sides accommodate the addition of liquid and accompaniments, making it an excellent choice for one-pot meals. 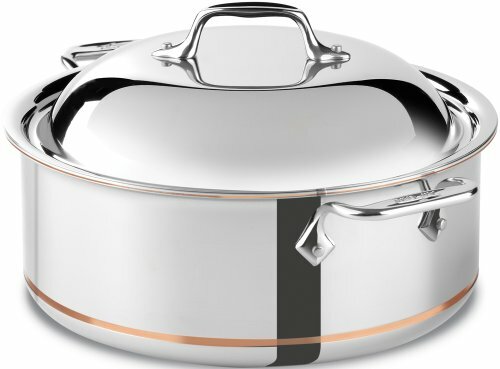 The pan's distinctive domed lid locks in heat and circulates moisture, delivering tender, flavorful results. Designed for professional use, COPPER CORE features 5-ply construction with a copper center, which transfers heat and spreads it quickly, evenly, and precisely throughout the cookware, all the way to the rim. The super-responsive cookware works well for recipes that require precise temperature control, such as delicate sauces. COPPER CORE's 18/10 stainless-steel interior offers a highly polished cooking surface with a starburst finish for superior stick resistance, easy maintenance, and non-reactivity with food to preserve true flavor. Permanently attached with stainless-steel rivets, the cookware’s stainless-steel handles offer a heat choke to reduce heat transfer, a bolster for added control, and a comfortable contour that caters to a chef’s underhand grip. Made in the USA, All-Clad COPPER CORE cookware offers induction compatibility, flared edges for drip-free pouring, engraved capacity markings, and upscale aesthetics with a copper skive cut away for long-lasting beauty in any kitchen.